Virtually all thermal insulation whether it is installed in exterior walls or in the attic should have a vapour barrier. The barrier is ALWAYS installed on the heated side of the wall or ceiling. This is to prevent moist air from getting into the wall cavity where it will condense and may promote mold and mildew growth. For more information on vapour barriers and air barriers click here. There are studies suggesting that particles from some types of insulation can be linked to respiratory problems and cause (temporary) skin irritation. Therefore, when handling any type of insulation always wear long sleeved tops, gloves, eye protection and a face mask. Having the work area well ventilated is also recommended. R-Value, blown: R3.6 per inch. R-value, poured: R3.4 per inch. Cellulose is the oldest building insulation material. Over the years many types of cellulose materials have been used, including newspaper, cardboard, cotton, straw, sawdust, hemp and corncob. 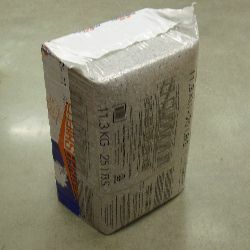 Modern cellulose insulation, made from recycled newspaper and cardboard, using grinding and dust removing machines and adding a fire retardant, began in the 1950s and came into general use during the 1970s. The added chemicals also resist fire and fungal growth. Despite the use of dust removing machinery there is still a fair amount of dust when the insulation is disturbed. * Cellulose is approximately three times denser then fiberglass. This helps deaden the sound through walls and between floor levels. * Due to its density it may slow down the spread of a fire because there is less oxygen in the product. * Cellulose is a "green" product. It has the highest recycled content of any insulation material and also has less embodied energy. It may take eight time less energy to produce than other insulating products. Loose-fill cellulose insulation can be used in retrofitting old homes by blowing the cellulose into holes drilled into the tops of the walls. It can also be blown into a new wall construction. It is also a good attic insulation as it will fill irregular spaces between framing members, electrical outlets for ceiling lights and around other ceiling penetrations such as plumbing stacks, exhaust vents and chimneys. It is ideal for hard to reach places where it would be difficult or impossible to install other types of insulations. 11.3 kg (25 lbs.) bag of cellulose insulation. There are studies suggesting that particles from some types of insulation can be linked to respiratory problems and cause (temporary) skin irritation. Therefore, when handling any type of insulation always wear long sleeved tops, gloves, eye protection and a face mask. Having the work area well ventilated is also recommended.